Netflix VS Dstv. Recently, some people think Netflix is better than Dstv and this has become the uprising of the big competition Netflix VS Dstv. This competition has been going on peacefully and quietly for some time until recently. 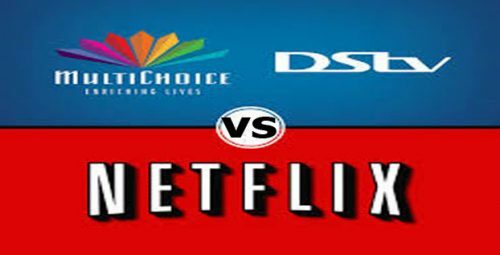 With this competition Netflix VS Dstv going on, it is truly difficult to choose which one you should use. Well, let’s go on a short trip below. Now the hot decoder Dstv has been around for quite a while. Let do some math’s now Dstv on a predetermined twenty four months contract will cost you R42 914 as you will be paying for a TV license of R530 and a fast internet connection at R19 368. While Netflix on the other hand applying the same method will cost youR23 742.47 for a two year subscription, that is twenty four months. Now it would seem as if Netflix won, yes it is true, the pricing and everything but let us not judge too quickly. Despite the cool pricing some people still stick around Dstv. Dstv is a popular premium TV service that has established some level of dominance in Nigeria. Dstv offers a decoder for you to watch all your favorite videos and channels by paying on monthly or yearly basis. Irrespective of the cost and Disadvantages Dstv has over Netflix, a lot of people still use Dstv because of sports. Dstv is known to provide extensive sports broadcasting roster and it seem to be the only glue holding it together now.it has been discovered that a lot of people who are using the Dstv subscription still stick around for the sports channel and display. It is not only we, the common individuals that have been debating about this topic. Some highly notable men in the world have made one or two statements about this competition also. The managing director of World Wide Worx Arthur Goldstruck believes that Netflix as a matter of fact is going to struggle to beat Dstv’s five million subscribers. However he has also stated that Netflix poses a serious threat to Dstv and once Dstv loses right to the English premier league and local Rugby, it is completely game over. He believes that if Dstv continues providing an excellent display of sports Netflix is still a long way in overthrowing Dstv however Dstv should reduce their prices.